There are some basic tools and techniques that are common to most (if not all) polymer clay projects. Whether you're interested in making canes and beads, mokume gane, mica shift patterns, image transfers, faux stones, or any of the other countless projects that are making polymer clay so popular, starting off with the right knowledge and equipment is essential to success. Please note that while working with clay is a fun and safe activity, polymer clays contain plasticizers and other chemicals and we do not recommend baking them in your regular home oven or using the same knives and other utensils that you use for cooking and eating. Clay will stain wood and other materials. To protect your table or other work surfaces, you will need a smooth piece of tile to work on, plus a smaller piece of tile for baking. You can pick up a few pieces of tile from Lowes or Home Depot. You'll want to place a non-skid pad under the tile while you're working to keep the tile still. Dust and other debris will stick to raw clay. Keep your work area as clean as possible. Keeping baby wipes or alcohol wipes nearby is very handy to clean your tiles and tools. To prevent visible dirt, dust or lint from appearing in your projects, wash your hands before working with clay. Although polymer clay is relatively smooth, small amounts can stick to your hands. A good barrier lotion, Gloves in a Bottle for example, helps protect your skin. Always wash your hands thoroughly after working with clay as well. As polymer clay can start curing at about 90 degrees, it is important to store it in a cool place. Keep it in its original wrapping so that you'll always have the manufacturer's instructions for curing. Once open, wrap the package in something protective such as wax paper. This will protect the surrounding surfaces from being stained in case the plasticizers leach. For extra protection from drying out, zip-seal plastic bags can hold several blocks of wrapped clay. 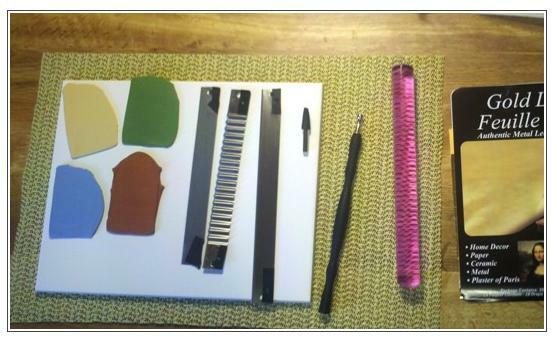 Before beginning any project, your polymer clay must be conditioned. After the mixing and manipulation that occurs during manufacture, clay will "rest". During this time it can become stiff and somewhat crumbly, making it difficult to work with. Some brands are stiffer than others. You condition clay by kneading. You can squeeze it, roll it into logs, bend it, stretch it, twist it - anything to get it working. It should take about five minutes or even less, but the test is the look and the feel. When clay is ready for work it will appear smoother with the edges less crumbly, and will be softer, shiny and more pliable. A "pasta machine" is the easiest solution and produces a smooth sheet of clay with a consistent thickness. In addition to producing a nice, even piece of clay, it is useful for blending colors and working with texture sheets. Although an actual pasta machine intended for the kitchen can be quite expensive, simple machines intended for clay work are available at craft shops. These have an adjustment knob which allows usually 9 varied thickness settings. Always begin conditioning at the thickest setting, and progress to your desired thinner setting. Before beginning, compress your clay to be slightly thicker than the thickest setting to avoid damage to your machine. An acrylic rod is very handy for working with thicker pieces than a pasta machine can handle. A fondant roller (used by bakers in cake making) is another option for general rolling. It has graduated gaskets at each end to produce varied thicknesses of clay sheets. Some people use a brayer - a hand tool used to spread ink in print making. Any of these are valuable tools for smoothing clay once it is on your tile and cannot be moved. A proper cutting tool is essential. A thick or dull blade will distort your projects. Tissue blades, available at craft stores, are straight, flexible, and very sharp. These are useful in all types of cutting, from slicing fresh unconditioned clay off your new block, to shaping the perimeter of your project, even slicing canes. Craft stores also have cutters, similar to cookie cutters, in various shapes. There are many additional specialized tools to help you in cutting and shaping. Examples include needle tools used for piercing beads, ball tools used to impress and distort layered stacks of clay, blending tools to smooth seams, and tools used in cutting shapes freehand. Basic clay working tool kits are available. They are a good investment enabling you to get a variety of handy tools at a reasonable price. Heat is necessary to cure polymer clay. Curing transforms soft, raw clay into a hard and strong form that can be carved, sanded, polished or otherwise finished. Different brands of clay cure at different temperatures. FIMO, for example is recommended for hardening at 230F(110C), Premo! Sculpey and other Sculpey clays at 275F(130C), and Kato at 300F(150C). Always follow the manufacturer's recommendations. Never exceed the recommended temperatures, as irritating and possibly harmful fumes can be released. Pets, especially birds are sensitive to these fumes. Always bake in a well ventilated area. Never microwave your clay. Craft stores sell ovens intended for clay work, but a conventional toaster oven from Walmart or another department store will serve you just as well and can save you quite a bit of money. You will need an oven with a timer that goes to 30 minutes and with a temperature that will go to 300 degrees Fahrenheit. An oven thermometer with a nice, big gauge is a must-have. Most ovens aren't "true" to the temperature indicated on the dial. You will need to test your oven. Once you've determined the actual baking temperature compared to the setting on your dial, you can mark one or more spots with electrical tape. Most ovens will not hold a consistent temperature throughout your baking time. Keep the thermometer in the oven while the clay is baking, monitor the temperature throughout the process, and be ready to adjust your oven as necessary. When you are finished baking your clay, allow the oven and its contents to cool. 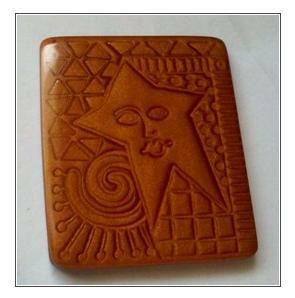 It is normal for your clay to stick to the baking tile, creating a shiny surface where they were touching. Once your tile and clay are cool to the touch, you can separate them. The shine can easily be removed by wet-sanding, if you wish to remove it.